If you are looking for beautifully designed housing for your pets, you have come to the right place. We stock an extensive collection of handcrafted wooden animal housing and woodcraft products for your garden. Whether you need rabbit hutches with long runs or a wooden bridge for your garden stream; we design and deliver all our products to bring you the very best in garden woodcraft. Find a luxurious range of wooden pet homes that are uniquely designed to the highest specifications. Whether you require wooden rabbit hutches, wooden rabbit runs, wooden chicken coops, wooden bird tables, wooden dog kennels or wooden garden bridges; our talented team can create bespoke designs to suit your needs. Whether you need large rabbit hutches or runs to fit the length of your garden space; our handmade products can be tailored to your requirements. 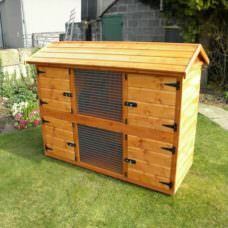 With Garden Woodcraft, you can trust the quality of all our rabbit hutches, aviaries and animal pens. With over 30 years experience building products for the pet, aquatic and wild bird industry; you can be sure to find the highest quality materials at the best possible prices. Dedicated to superior customer service from start to finish; we will design, build, deliver and assemble your rabbit hutches or wooden bridges on-site for no extra cost. Browse our collection of wooden handcrafted products online today and find the perfect piece for your garden.